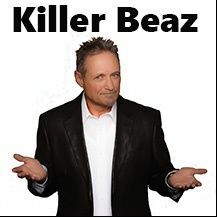 Killer Beaz has escaped to the attic to sneak in a few riffs on the guitar. But nothing feels right. His fingers and strings aren't producing the harmony. So he calls a radio disc jockey a thousand miles away. My suggestion was to cut five of the strings off and go totally one note.